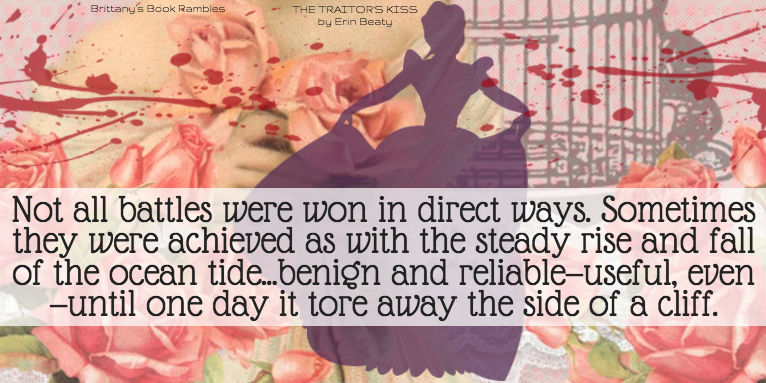 Brittany's Book Rambles: The Traitor's Kiss by Erin Beaty ARC Review + Giveaway! 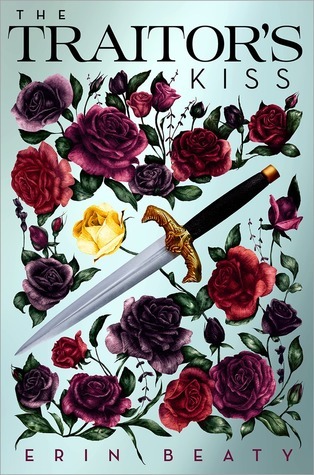 Looking at the cover of The Traitor's Kiss, you're given a false sense of security. You're probably thinking this is a nice and innocent book. I mean, look at the pretty roses! Well, let me tell you . . . it's actually guilty of conspiracy, several counts of murder, and not to mention, my pain and suffering—in a good way! In the first half of the story, you're made to believe that this is mostly an adorable, slow-burn romance. THEN, the second half hits, and all of a sudden, there is utter chaos, murder, and angst. Let me tell you—I was not prepared. That being said, this book is truly charming and incredibly well-developed. Every single plot element and each character has multiple layers and overlapping details—all of which seamlessly come together and contribute to the story. This book was masterfully planned to the point where I had to read it slowly, just to be sure that I didn't miss any of Erin Beaty's crumbs and intricacies as the story unfolded. Overall, I immensely enjoyed this book, and I'm so excited to see how this trilogy will develop and unfold in the future. 1) I adore the slow-burn romance between Alex and Sage. They start out as unlikely friends, hit some speed bumps and hurdles, and then slowly—their romance develops. Their relationship gradually unfurls as the story goes on and for me, it's truly the heart and soul of the book—despite all of the other intriguing things going on. 2) I looove Darnessa! She's like a cross between the matchmaker in Mulan and Galina from The Crown's Game. She's fierce, kind, knowledgeable and elegant, and the way her presence is constantly "hovering" throughout the story (even when she isn't necessarily in the scene) was fantastic. It's truly brilliant, because Darnessa is introduced in this "nothing gets past me" manner, and you absolutely feel that as you're reading. 3) It is no secret that I have a thing for soldiers, and Erin Beaty brought us a very dashing one in the form of Alex. He is the Captain of the Royal Guard—loved and respected by his men, the female (and probably some of the male) characters, and most importantly, by me. I liked his brooding and serious nature, and especially how deeply he cares for his loved ones. Thankfully, this book is the first in a trilogy, so I'm indescribably excited to get more of Alex in the next two installments! 4) The plot of this story is executed phenomenally. There are so many layers to it, so many intricate details woven throughout—some that you might think are insignificant, but then they pop up later and I was like . . . I had to pace myself while reading, just to catch all the little tidbits that proved to be significant later, and it was an experience! 1) The first half dragged a bit, but that's mainly because I'm impatient. In retrospect, it's clear that it was setting the groundwork for the intense part of the plot. 2) At times, I found the code names to be confusing. For example at one point, the main guy Alex, is known by a different name, which is actually the name of another character in the book, and at the same time, Alex, also has an undercover code name. My poor little brain had trouble keeping up with who's who from time to time. This sounds amazing. I've seen the cover around but I didn't really know what it was about until now. It seems like it would be right up my street. P.S. - love your use of GIFS <3 Great review! i am so excited to read this book! it is defs on my TBR and i really loved your review! good to hear you enjoyed it! This one sounds really good! I do love that cover! I definitely would have thought the story would have been a much sweeter read just from looking at it tho. lol! Sometimes those kind of surprises are nice. This chat was so much fun! Cannot wait to read this book! I love how you divided up your review into strengths and weaknesses. I also enjoy the gifs :) I'm going to Goodreads right now to add this exciting book. I am so excited to read this! When I got an ARC of this in the mail I pretty much started jumping up and down right there! I'm glad to hear you liked this one, and you're right about the cover - it's definitely the kind to lull you into a false sense of security! Awesome review! This book sounds so good! 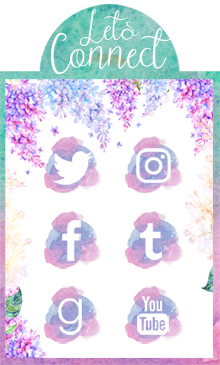 And the cover is beautiful (it actually matches your blog quite well, so flowery and lovely :) ) Thanks so much for the chance! Ah, yay, great review, Brittany! You make me want to read this book (because I actually wasn't so sure before). I love the sound of the romance, but I think I would have the same issue as you with all the codenames and real names and such. Confusing! I loved this review! I've been eyeing this book for some time, and have heard great things about it, so I'm glad you enjoyed it. This sounds AMAZING! I've been interested in this book since it first announced, so I'm glad it doesn't seem to disappoint. Thanks for the review and giveaway! You got me really excited for this book, it definitely sounds like my type. I totally agree with you about being impatient for books to pick up pace, I thought I was the only one. Just added this to my tbr list!! I absolutely love the cover. It sounds great! Yay :D Lovely review Brittany. <3 So glad you enjoyed this book so much :D Suffering and pain is the best thing, haha :D Thank you for sharing your thoughts about this one. <3 I'm curious. 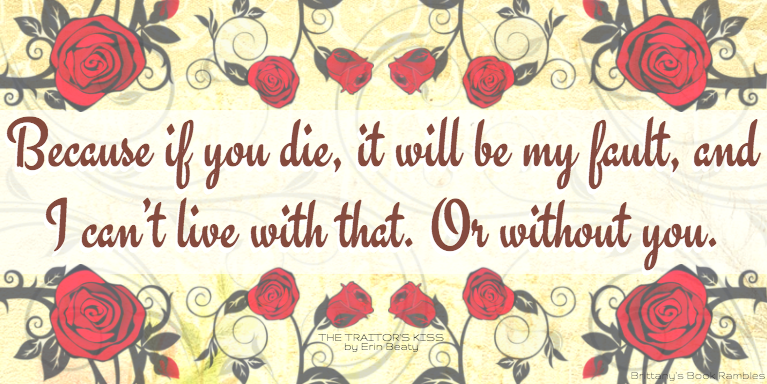 I loved your review, and I'm excited for The Traitor's Kiss now. I love the title, and it sounds like the books lives up to it! I'm so excited to read this book! The cover is gorgeous, and your review is amazing as usual! I love the cover of this one, and it sounds really good! Great review! I just finished reading The Traitor's Kiss the other night and really enjoyed it too! Not too much seemed to happen in the middle, yet I was still oddly captivated and intrigued. lol, as soon as I read matchmaker, I kept thinking of Mulan too! And I really liked Sage. Stubborn and clever and the kind of heroine I'll always cheer on to succeed. Definitely excited to read book two! Great review! This book is at the top of my TBR. I've been dying to read it for ages now! This has my favorite cover so far this year. It's gorgeous! Loved this book ! Could not put it down and the twists and turns made for a fun ride ! Sage is a super cool heroine- a combination of Belle and Mulan. Very excited to see where the rest of the series is headed- highly recommend this book !